On the train back to the airport (Sunday night, 8 p.m) there were few others in transit. 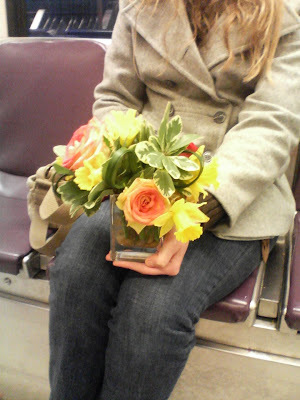 One apparently homeless fellow named Jesus was weaving his way through the long train with this lovely and slightly aged bouquet. He briefly had his eye on me, but then the train turned slightly, and Jesus spied Lovely Laura, with her flowing gold locks and her lovely green eyes. Thankfully she accepted his offering...and then chatted with him for three stops. After he detrained, we discussed the event and agreed, a lot worse things could happen to ya. Girl Party '08 in Phoenix ROCKS!! Girl Gang in Phoenix for GP08! The HVAC Upgrade is complete! Kelly Was Here! Kelly Was Here!